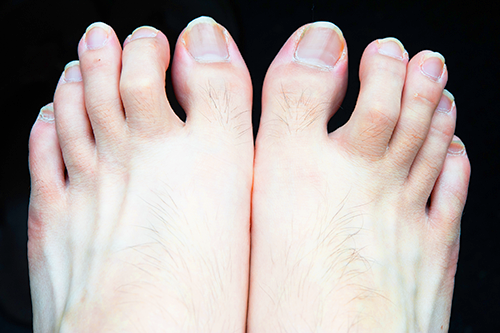 Hammertoe occurs in the second, third, and fourth toes and can be very painful. As indicated by its name, a hammertoe resembles a hammer or claw. The toe is bent downward resulting in a deformed or crooked appearance. The most common complaint is rubbing and irritation on the top of the bent toe. Loren Colon DPM, Jeffrey Flash DPM and their team at American Foot & Leg Specialists have years evaluating and treating the problems associated with this deformity. There are two types of hammertoe that indicate the severity of the deformity. Flexible and Rigid. Each type is classified based on the mobility of the joints. Flexible hammertoe: is the first stage of hammertoe. The toe can still be straightened manually. There may be several treatment options. Rigid hammertoe: develops following the flexible hammertoe stage and indicates a more severe case of hammertoe. The toe can no longer be straightened manually and range of motion is very restricted. It usually means that surgery is needed. Hammertoe results from a muscle imbalance that tightens and shortens the ligaments and tendons in the toe. This draws the toe downward, with the middle joint bent, and creates the characteristic hammertoe deformity. Typically, this occurs from wearing shoes that fit too tightly and have a tight toe box, not allowing for sufficient space for the toes. The incidence of hammertoe is higher in females due to their wearing of high heel shoes. The design of most high heel shoes not only allows limited room for the toes but forces them against the front of the toe box, bending the toes and not allowing them to lay flat. The chronic bending of toes leads to the muscles, ligaments, and tendons becoming permanently fixed in a bent position. This condition can also be present in individuals with arthritis or diabetic complications such as diabetic neuropathy. Hammertoe also occurs in children who wear shoes that are too small for their feet. It is important to check children’s shoes and be sure that they fit properly and have not been outgrown. Additionally, the condition can result from acute injuries, such as breaking or jamming the toe. In far more rare cases, every toe may be affected due to conditions associated with the nerves or spinal cord. Make sure you are wearing the proper footwear. Proper footwear includes shoes that have the appropriate toe box size for your specific foot characteristics. This will provide the space required to keep your toes uncrowded. And avoid high heels if possible. This is a significant preventative step. Our board-certified experts in podiatry consult with each patient before beginning an individualized treatment program utilizing our state-of-the-art diagnostic and therapeutic equipment. After consultation, our experts at American Foot & Leg Specialists may prescribe a physical therapy routine. Sometimes they fit patients with braces and splints to force the toe into a normal position, which works to stretch the shortened muscles, ligaments, and tendons. Exercises, such as picking up marbles and scrunching a towel with your toes are often prescribed. In more severe cases, outpatient surgery is necessary. These surgeries can involve cutting or moving ligaments and tendons. Sometimes the bones on either side of the effected joint must be fused together. At American Foot we do not take your suffering lightly. If you are experiencing foot pain we want to help you feel better. If you live south of Atlanta, Georgia, there is an office convenient to you. Patients from all over, including Griffin, Union City, Newnan, Forest Park, and Ellenwood give American Foot & Leg a “thumbs up.” Make an appointment today begin the process to eliminate your foot pain.